Zapdos in game: 1,786 Who? Important notice! Pokemon Zapdos is a fictional character of humans. 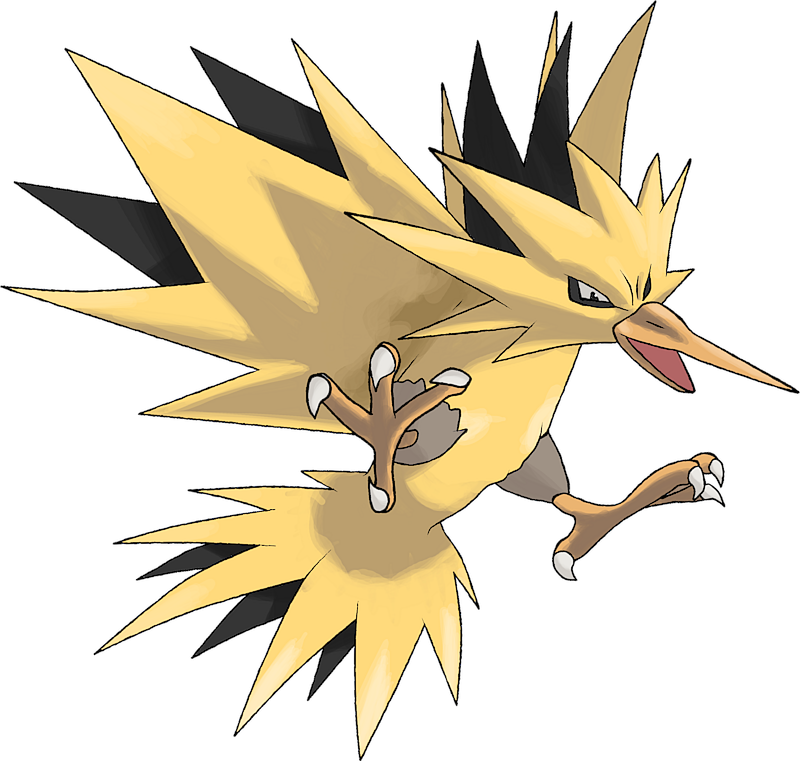 Zapdos is an avian Pokémon with predominantly yellow plumage. Black rings encircle its eyes, and it has a long, thin, light orange beak. Its wings and tail are a mass of spiky feathers, with black feathers covering the back of its wings and inner tail feathers. A large crest of spiked feathers surrounds its head. Its thighs are a khaki color, and it has anisodactyl feet ending in talons. Zapdos made its first true appearance in The Power of One. Lawrence III wanted to capture the three Legendary birds as well as their master Lugia. The Electric Pokémon made its anime debut appearance in As Clear As Crystal. When Team Rocket made an attempt to steal a crystal that gave a lake the ability to heal Electric-type Pokémon, they were side-tracked when Zapdos showed up and they changed their objective to capture Zapdos instead. 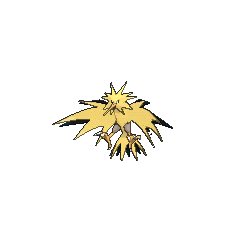 A Zapdos appeared in An Electrifying Rage! where it battled Ash's Talonflame, Hawlucha and his newly evolved Noivern. 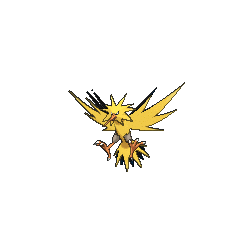 A rough image of Zapdos was first seen etched in a stone hanging in the Viridian Pokémon Center in Pokémon Emergency. The first time Zapdos was seen was in Island of the Giant Pokémon. However, it wasn't a real Zapdos, just a machine. A Zapdos appeared in An EGG-sighting Adventure! as part of Team Rocket's fantasy. A Zapdos made an appearance in the credits of Pokémon Ranger and the Temple of the Sea. Jackie had captured it with a Capture Styler and flew away on it. A Zapdos made a cameo appearance in Doc Brock!. This may have been taken from Pokémon Platinum, where in this version, there is a Zapdos roaming Sinnoh. Presumably the same Zapdos made a cameo in a flashback in Dealing With a Fierce Double Ditto Drama!, and both of Narissa's Ditto transformed into it. A Zapdos made a cameo in the intro of Lucario and the Mystery of Mew, The Rise of Darkrai and Zoroark: Master of Illusions. A photograph of a Zapdos appeared in A Legendary Photo Op!. EP242 Zapdos Ash's Pokédex Zapdos, the Electric Pokémon. 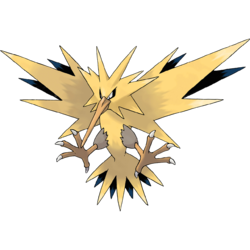 Zapdos has both electric and flying elements and the flappage of its wings can compose lightning. A wild Zapdos appeared in The Adventure. Green later captures Zapdos before the Gold, Silver, & Crystal chapter and uses it against Will and Karen, having caught it and its Legendary bird companions on her personal training journey to overcome her fear of birds. During this battle, it is lent to Blue when things get rough. Once returned, it is put back in its Poké Ball and isn't seen again, meaning it has either been deposited into her box or released. It composes thunderbolts in the air and discharges electricity. 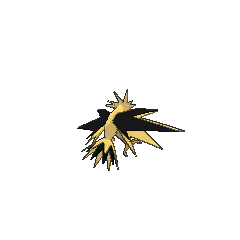 Of all Legendary Pokémon with fixed in-game locations, Zapdos can be obtained with the fewest number of Badges: 3. 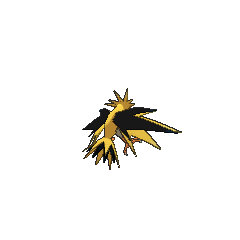 In the Generation I games and their remakes, the player can catch Zapdos with only the Boulder Badge, Cascade Badge, and Soul Badge. Zapdos may be based on the Native American legend of the thunderbird. The thunderbird was known for being the spirit of thunder, lightning, and rain in the form of a giant bird. The beating of the wings was said to compose thunder. It may also have been based on the lightning bird, a bird breed from wherever lightning hits the earth. Aesthetically it may also be based of hummingbirds, due to the long beak, the rather simple wings and described violent behaviour.